Pre-heat your oven to 180℃ / 350℉ (about 10 minutes before you are ready to bake the lasagne). I personally like to soak all legumes overnight in water with a splash of vinegar, so do this with the puy lentils if you like (you don't have to, but I'd recommend it). I used my Thermomix to do all the chopping, but you can easily use a regular food processor or grate/ finely dice all the veggies by hand. No need to wash or rinse the food processor in between each step too. In a food processor or thermomix chop your garlic (TMX 5 secs, speed 5) and then onion (TMX 5 secs, speed 4). Heat a large pan over a low heat and add the olive oil (or you can use ghee or butter if not vegan). Add the chopped garlic/onion and gently sauté whilst processing the other veggies. Now pop the celery, carrots and zucchini into your food processor and pulse to chop - you are looking for a course consistency so be careful not to over process (TMX use the turbo button, quick pulses until the right consistency, about 2-3 should do it look through the lid after each pulse). Alternatively grate the carrot and zucchini and finely dice the celery. Add this to the pan with the onion. Sauté for a few minutes with the bay leaves and thyme leaves. Pulse the mushrooms in the food processor until just chopped (TMX pulse 1-2 times). Add them to the pan with the Puy lentils, tomato paste, stock and diced tomatoes. Season, stir to combine and allow to simmer with the lid ajar, stirring occasionally, until the sauce thickens and the lentils are cooked. This will take about 30 minutes. Once cooked, add the chopped spinach and stir though to wilt it. Taste, adjust the seasoning if you need to (salt brings out the flavour so don't be shy). Remove from the heat and set aside. Grate the cheese (in the processor and set aside). For the Thermomix method, follow the recipe for Béchamel in your basic cookbook. In a medium sized pot, melt the butter over a low heat. Remove from the heat and add the flour mixing to combine. Return to a medium to high heat and gradually add the milk, approx. half a cup at a time mixing constantly. As it heats it will thicken, this is when you should add another half a cup of milk. Do this until all the milk is added and the sauce is thick. Add about a quarter of the cheese, season with sea salt and pepper to taste, and stir well (reserve the rest of the cheese for the top of the lasagne). 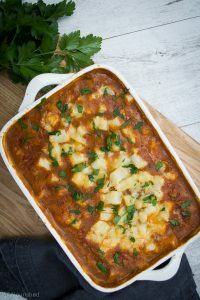 To assemble the lasagne, use a medium size baking dish (mine is 25 x 25cm), placing half of the lentil sauce in the base, top with lasagne sheets, then the remaining lentil sauce, another layer of pasta and finish with the cheese sauce and the remaining grated cheese. Bake for 30 - 45 minute or until the lasagne is cooked through. Choose gluten-free lasagne sheets and for grain free layer with thinly sliced eggplant (aubergine) or zucchini (courgette). Steam half a large head of cauliflower, then puree with a tablespoon of nutritional yeast, a generous pinch of sea salt and pepper and a splash of almond milk to achieve a Béchamel consistency (thick sauce). Top with grated vegan cheese. Replace both with finely diced fennel sautéed with a pinch of cumin and chilli powder. I personally used my TMX for all the preparation (chopping) and making the cheese sauce but cooked the lentil sauce in the pan as I prefer the consistency the pan produces (plus the volume of the sauce is pushing the bowl limits). But if you did want to cook it all in the TMX, I'd cook on reverse, speed 1, temp 100, 30 minutes (or until the lentils are cooked through) with the lid ajar. The lasagne can be made ahead, refrigerated and re-heated as required. It can also be portioned and frozen. You can also serve this as a pasta sauce if you can't be bothered with the few extra steps to the lasagne. Enjoy! I'd love to hear how you and your family enjoyed this tasty dish. Please leave a comment and let me know what you think (star rating extra appreciated as that way this recipe will entice even more people). Hi Georgia, I’m curious to know why you are a vegetarian no longer? I have red lentils in the cupboard (not able to get any French ones at the moment), will these substitute in okay? Wow, what a delicious lasagne and my meat-loving kids also devoured it! I used konjac lasagne noodles as it was all I had on hand. I’ve made a note for next time to reduce the overall liquid if using the konjac or paleo crepes as they don’t absorb the liquid as much as traditional lasagne sheets. Another wonderful recipe Georgia. Thanks! You’ve done it again Georgie – from the moment I licked the spoon with cheese sauce and mushroom mix on it, before it had even been fully assembled, I was licking my lips! 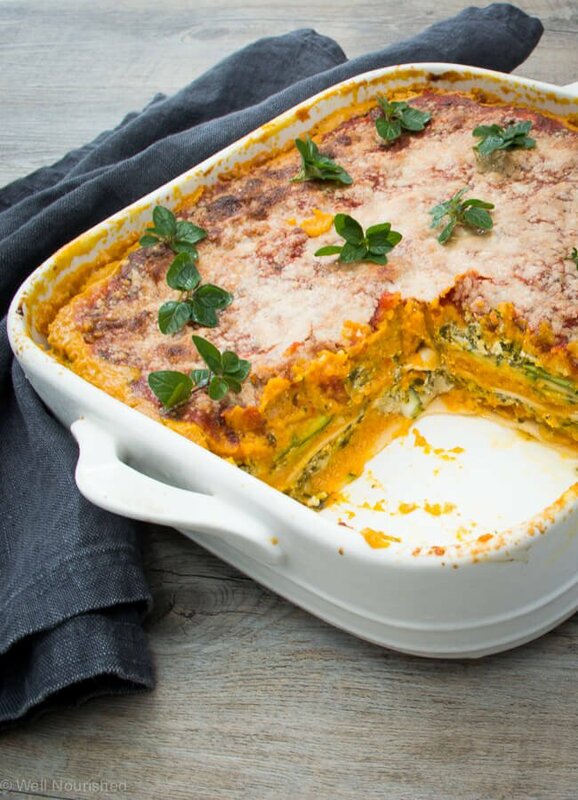 Great combination of ingredients and makes a nutritious alternative to meat lasagne! My tummy says thanks. Absolutely delicious and even my kids gave it 5 stars. I added a bit of white wine and used tinned lentils (and forgot to put the spinach in!!). A perfect vegetarian dish! Absolutely 10 out of 10! I would of eaten the whole thing it was that great and the cauliflower sauce…perfect! Even my hubby loved it, my 3 year old ate it all and 5 year old ate most (but he is being a tad picky at the moment). I knew i would love it but if it passes the husband and kids test then it’s a winner! We aren’t vegetarian but you couldn’t even notice the lack of meat. Delicious! Absolutely delicious! Gobbled down by my 3YO, 5YO and meat loving husband too!! Absolutely delicious. Even without a thermomix, it was easy to make. I found I only had wholemeal spelt flour so gave it a go for the cheese sauce and despite having a different colour, it worked fine. This one will be on the repeat list. This was a fav in my house. Fussy, no mushroom eaters and it was all gone with not a grizzle and a request to make again! Totally delish! I would happily feed this to the masses! Going to try a dairy free version next week. Thanks Georgia! Hi Georgia. Finally got around to baking this one up (lasagnes are generally a bit of a pain). But this one was so worth the effort! And the kids requested a slice for breaky (fantastic choice I reakon!). I am thinking that I will fry a bit of garlic into the roux next time, and will be making a double batch as this one went way too fast! Totally yum! This lasagna is amazing!!! My family loved it – I will never eat a traditional meat lasagna again (not that we eat them often anyways). I’m trying to increase our number of meat free meals – this will be cooked again & again!! Thank you ? Yummy! I’m not vegetarian and I’ve been looking for extremely tasty veggie dishes that I would love to make on a regular basis. This is totally it. I also made it for my extended family and they loved it too. Also great reheated. My family loved this. I just put grated cheese on the top instead of making the sauce and it still tasted really good. Thanks Georgia! This is fantastic. My meat eating husband said best lasagne he has ever had. 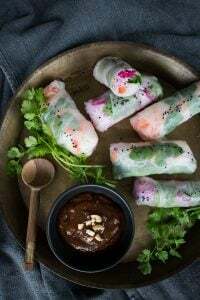 I have shared recipe with friend super easy. I always tweak recipes depending on my pantry so my tweak was adding soaked dried porcini mushrooms. Thank you this is a great website. I love getting your new recipe ideas. Delicious! A really great recipe. My son even asked for a serve in his lunchbox the next day and enjoyed it cold! I have just made this for dinner tonight and i just wanted to say thankyou for an absolutely delicious recipe. This is one of the few meals my husband, 4yo, 18month old and myself can all agree on. We usually eat meat every night of the week but it certainly was not missed in this recipe. Truly delicious. Made this tonight and it was really tasty! So happy, the whole family enjoyed it and made a bit extra for tomorrow night. Absolutely delicious. The kids ate it all up even though they say they dont like mushroom. I will definitely make this again. I really enjoyed this lasagne. It is hearty (perfect for this time of the year in Melbourne) and reheats really well for the next night. I did a few modifications not all planed – I used less mushrooms (didn’t have enough) less carrot and no cheese in the cheese sauce. I used the rest of your measurements for the sauce and I have to say it turned out great! Will be making this a regular meal. Hi. I can’t wait till make this. Is there a print function on your recipes at all? New to all this. ? Hi Tegan, I know you will love it, it’s been so popular. Im planning to make this next week, is tomato puree the same as tomato paste? We do vegetarian tuesdays, so this will be perfect. Hi Georgia .Is that correct to sub 3 tbspn tomato puree with 2 can of tomatoes.would not 2 can be too much liquid? If using canned lentils would I just use one tin? This is amazing! Definitely adding this to our monthly meal plan. Thank you for another great recipe ? A great recipe. A hit with all the family – even the meat eaters! Yummy lasagne, even better the next day as leftovers! My fussy 2 1/2 year old loved it as well as hubby. Great to find a nutritious dish the whole family enjoys, will definitely be making it again! This is seriously incredible. A must try for even the most staunch of meat eaters. Yummmm!! So glad I found this recipe. Absolutely delicious. Kids were super impressed! This was absolutely delicious. I made the vegan version and my fussy son and husband both loved it. Hubby told me to ‘put this one on our meal rotation’ ? Hi there! By milk of your choice – does this also include nut milks? I am okay with dairy but like to do a little less if possible. If this would work, what nut milk do you think would work best? thanks! Wow, this lasagne has so much flavour! I will definitely make it again. Delicious! I’ve introduced my family to meat free Monday’s and this recipe went down very well with my meat loving husband and fussy toddler. The toddler even asked for seconds which rarely happens! Thank you Georgia, I look forward to exploring more of your recipes.